Thermal Product Solutions (TPS), a global manufacturer of thermal-processing equipment, announced the shipment of a Blue M Mechanical Convection Oven to a manufacturer of consumer products. Thermal Product Solutions (TPS), a global manufacturer of thermal-processing equipment, announced the shipment of a Blue M Mechanical Convection Oven to a manufacturer of consumer products. This DC-256 model Blue M oven includes a NIST Certificate of Calibration at 300°F. The temperature range of this Blue M convection oven is 100°F to 600°F and has work chamber dimensions of 25” W X 20” D x 20” H. The mechanical convection oven features a pneumatically actuated vertical lift door with a safety door switch and light curtain to detect any obstruction prior to allowing the door to close. A 550 CFM powered exhaust was included for faster cool down time. Custom programming was also included to link the oven controller system to the customer’s automated PLC controller. This programming allowed the signals from the door, shelf sensors, limit switches, locks, light curtains and oven controls to be communicated to the customer PLC. An overtemperature controller is included as a standard to prevent over-heating. Blue M is recognized as an industry leader in the design, engineering, manufacture and after-market support of industrial and laboratory ovens that are ideal for a wide range of applications. Blue M products are available in bench top, stacked and cabinet models to accommodate a variety of capabilities and footprints. Thermal Product Solutions (“TPS”), is a leading American manufacturer of industrial ovens, furnaces, pharmaceutical sterilizers, laboratory ovens, environmental temperature chambers and stability test chambers. 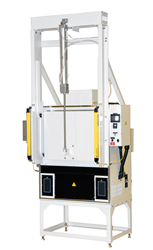 TPS provides thermal processing and test solutions for a range of industries. TPS brands include Baker Furnace, Blue M, Gruenberg, Tenney, Lindberg, Lunaire, MPH and Wisconsin Oven. For more information, visit http://www.thermalproductsolutions.com.